Michael Collins is a 1996 historical biopic written and directed by Neil Jordan and starring Liam Neeson as Michael Collins, the Irish patriot and revolutionary who died in the Irish Civil War. It won the Golden Lion at the Venice Film Festival. 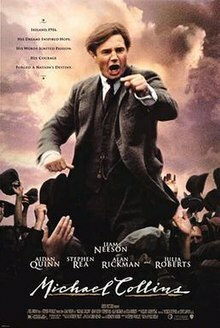 The film opens in media res in 1922 immediately after Michael Collins' death, as Joe O'Reilly, a long-time comrade of Collins, attempts to console a mourning Kitty Kiernan. The story shifts back to the closing years of Britain's rule over Ireland from its base in Dublin Castle, when Irish Republicans fight for Irish independence against Britain and its military and police forces. At the end of the Easter Rising in 1916, Collins, Harry Boland, Éamon de Valera, and other besieged Irish rebels at the Dublin GPO surrender to the British Army. As the Dublin Metropolitan Police's G Division (counter-insurgency squad) identifies leaders of the uprising, Collins tells Boland that next time, "We won't play by their rules, Harry. We'll invent our own." Multiple leaders involved the fighting (Patrick Pearse, Thomas MacDonagh, Tom Clarke and James Connolly depicted) die by firing squad at Kilmainham Gaol, but de Valera, an American citizen, is imprisoned, as are Collins, Boland, and the others. Following overwhelming victory in a general election, Sinn Féin establishes a breakaway government and unilaterally declares Irish independence, signalling the start of the Irish War of Independence. De Valera is elected President of the First Dáil, and Collins is appointed Minister for Intelligence in the Cabinet while taking initiative training and arming the nascent IRA by raiding RIC barracks for weapons. In May 1918, at a local by-election rally speech campaigning for Joseph McGuinness, Collins is injured when the RIC break up the rally. While recovering on a friend's farm, Collins and Boland meet Kitty, who begins a romance with Boland. Several weeks later, Ned Broy, a sympathetic G Division inspector who has been observing Collins and Boland, tips Collins off that the Castle plans to arrest de Valera and his Cabinet. However, de Valera forbids anyone to go into hiding, stating that the ensuing public outcry will force their immediate release. Only Collins and Boland escape arrest and imprisonment, and there are no protests. Left in command, Collins seeks help from Broy to gather information on Castle spies and informers. After issuing a statement that all collaboration with the British will be punished by death, Collins initiates a campaign of assassinations on agents and collaborators using recruits from the IRA's Dublin Brigade. Meanwhile, de Valera breaks out of Lincoln Gaol in England with the help of Collins and Boland. To Collins' reluctance, de Valera plans to travel to the United States to seek recognition from Woodrow Wilson and orders Boland to accompany him. Before they depart, Collins suggests to Boland his belief that de Valera fears being overshadowed by leaving them alone together. As the War of Independence intensifies, the British strengthen their military presence and assign Soames, a hardened SIS agent, to lead a new counter-intelligence team tasked to combat the IRA. Heeding Broy's warning of the new threat, Collins deploys a hit squad that simultaneously assassinates Soames and agents under his command. In retaliation, the Black and Tans and Auxiliaries fire at an unarmed crowd at a Gaelic football match at Croke Park, killing many Irishmen. While in hiding, Collins and Kitty bond intimately. Collins also learns that Broy was tortured and killed after he was caught by Soames frantically destroying Castle documents. De Valera and Boland return from America empty-handed. Seeking improved leverage in peace talks with the British and citing Collins' guerrilla tactics as detrimental to the image of the independence movement, de Valera decrees that the IRA must act more like a regular army by launching a formal military attack on The Custom House, the centre of the British administration in Ireland. Collins protests that fighting conventionally will allow the British to win, but the Cabinet votes to support de Valera. The attack fails catastrophically, leaving six men dead and seventy captured. In the aftermath, Collins declares to de Valera that the IRA can only hold out for a month, but in private, he tells Boland that the IRA will be lucky to hold out for another week. To his surprise, however, the British soon call for a ceasefire. De Valera orders Collins to go to London to participate in negotiations with the British on the future of Ireland, despite Collins's objections that he is not a diplomat. The Anglo-Irish Treaty is subsequently signed in December 1921, averting an unwinnable war with Britain and granting Ireland the freedom to achieve the Republic in time, albeit with the state becoming a British dominion in the interim and at the expense of six of the nine Ulster counties, dividing the island between the British north and Irish south. De Valera, who sought unconditional independence, erupts upon learning that the terms have been published without his agreement. Following a tense debate at the Second Dáil, the Treaty is approved 64–57, prompting de Valera and his supporters (including Boland) to resign in protest. As events unfold, Kitty professes her rejection of Boland, and Collins successfully proposes to Kitty. Relations between Collins and Boland deteriorate. As Ireland begins its transition into a Free State, a people's vote on the Treaty follows the Dáil vote, with Collins and de Valera campaigning to sway people in their respective directions. Despite violence from anti-Treaty Republicans, the Treaty is backed by popular vote, a result that de Valera and his supporters continue to reject. In June 1922, the anti-Treaty IRA seize the Four Courts in Dublin. Ordered by Arthur Griffith's Cabinet to retake the Four Courts, Collins (now Chief of Staff of the National Army) is appalled having to fight former comrades, but obliges when Griffith warns him that if the National Army will not deal with the IRA, the British Army will. In the subsequent Battle of Dublin, the IRA is driven from the city. Despite Collins' attempts to capture him, Boland is shot by a sentry while trying to swim the Liffey. Devastated by Boland's death, Collins desires to meet de Valera. Learning that de Valera is hiding out in West Cork, Collins' native land, he embarks on a trip there with O'Reilly. At a local pub, Collins' reaches out to de Valera's intermediary, seeking peace talks and passing the word of Boland's fate. Unable to extract a response from de Valera, who is equally distraught of Boland's death, the intermediary misdirects Collins into a trap, with the deception that de Valera will meet him in the village of Béal na Bláth. On route, Collins' convoy is ambushed by IRA men led by the intermediary, and Collins is fatally shot after breaking cover. Kitty is informed of Collins' death just after trying on a wedding gown. Completing his story, O'Reilly tells Kitty that Collins would not want her to mourn as long as she has. Michael Cimino wrote a script and was involved in pre-production work on a possible Collins film for over a year in the early 1990s with Gabriel Byrne attached to star. Cimino was fired over budget concerns. Neil Jordan mentions in his film diary that Kevin Costner had also been interested in developing a movie about Collins and had visited Béal na Bláth and the surrounding areas. The film was scripted and directed by Neil Jordan. The soundtrack was written by Elliot Goldenthal. The film was an international co-production between companies in Ireland and the United States. With a budget estimated at $25 million, with 10%-12% from the Irish Film Board, it was one of the most expensive films ever produced in Ireland. While filming, the breakdown of the IRA ceasefire caused the film's release to be delayed from June to December which caused Warner Bros. executive Rob Friedman to pressure the director to reshoot the ending to focus on the love story between Collins and Kiernan, in an attempt to downplay the breakdown of Anglo-Irish Treaty negotiations. A number of Irish actors auditioned for the part of de Valera but Jordan felt they weren't able to find a real character and were playing a stereotype of de Valera. Jordan met with John Turturro about the role before casting Alan Rickman. Jordan initially envisioned Stephen Rea playing Harry Boland, but then decided the role of Broy would give Rea more of a challenge. Matt Dillon and Adam Baldwin also auditioned for the role. Aengus O'Malley, a great grandnephew of Michael Collins, played the role of a student filmed in Marsh's Library. Although based on historical events, the film does contain some alterations and fictionalisations, such as the dramatised circumstance of Harry Boland's death and Ned Broy's fate, and significant altercations to the formative years of Dáil Éireann and the prelude to the events of the first "Bloody Sunday" at Croke Park. Neil Jordan defended his film by saying that it could not provide an entirely accurate account of events, given that it was a two-hour film that had to be understandable to an international audience who would not know the minutiae of Irish history. The documentary on the DVD release of the film also discusses its fictional aspects. Critic Roger Ebert referred to the closing quotation from de Valera that history would vindicate Collins at his own expense, writing that "even Dev could hardly have imagined this film biography of Collins, which portrays De Valera as a weak, mannered, sniveling prima donna whose grandstanding led to decades of unnecessary bloodshed in, and over, Ireland." Jordan's film heavily implies that De Valera had a hand in the assassination of Michael Collins. Boland did not die in the manner suggested by the film. He was shot in a skirmish with Irish Free State soldiers in The Grand Hotel, Skerries, North Co. Dublin in the aftermath of the Battle of Dublin. The hotel has since been demolished but a plaque was put where the building used to be. His last words in the film - "Have they got Mick Collins yet?" - are however, based on a well-known tradition. The score was written by acclaimed composer Elliot Goldenthal, and features performances by Sinéad O'Connor. Frank Patterson also performs with the Cafe Orchestra in the film and on the album. The Irish Film Censor initially intended to give the film an over-15 Certificate, but later decided that it should be released with a PG certificate because of its historical importance. The censor issued a press statement defending his decision, claiming the film was a landmark in Irish cinema and that "because of the subject matter, parents should have the option of making their own decision as to whether their children should see the film or not". The video release was, however, given a 12 certificate. The film was rated 15 in the United Kingdom by the British Board of Film Classification. The film currently has a score of 77% on Rotten Tomatoes from 47 reviews. The film became the highest-grossing film ever in Ireland upon its release, making IR£ 4 million. In 2000, it was second only to Titanic in this category. It received generally positive reviews, but was mildly criticized for some historical inaccuracies. ^ "Michael Collins (1996) - Financial Information". The-numbers.com. Retrieved 2016-11-28. ^ "The awards of the Venice Film Festival". Labiennale.org. Retrieved 2010-09-30. ^ a b c "Between Irish National Cinema and Hollywood: Neil Jordan's Michael Collins" (PDF). Retrieved 2010-09-30. ^ "Michael Collins", The South Bank Show, 27 October 1996. ^ "MICHAEL COLLINS | British Board of Film Classification". Bbfc.co.uk. Retrieved 2016-11-28. Seán Farrell Moran, movie review, "Michael Collins," in The American Historical Review, 1997.